Would you believe, I started writing this post last December, while sailing down the Irrawaddy River from Mandalay to Bagan in Burma! But I never got around to posting it before Christmas, and now, another year has passed, I’m in Malaysia and it’s Christmas Eve! I love this festive time of the year, leading up to Christmas. Stores are selling all my favourite Christmas treats like stollen and panettone, and I usually bake gingerbread men and ginger cookies. Last year, my good friend Laurie suggested we get together and make whipped shortbread using her mother’s tried and tested recipe. I’d been wanting to make shortbread for the longest time and was really looking forward to our day of baking. Laurie even bought a bunch of X’mas tins as gift boxes for our cookies. Isn’t that a great idea?! We ended up making two batches (and eating quite a few along the way…they were just too good to resist!). This year, I decided to make these cookies again. I’d forgotten whether we had used salted or unsalted butter last year, and I decided to go with the latter. Well, I soon learned my lesson. There are a lot of recipes where using salted or unsalted butter may not make such a big difference, but here, it definitely does. Do NOT use unsalted butter! The cookies tasted bland and powdery, not like the way I remembered them. What a huge disappointment! I made them again, using salted butter. Yes, that’s the way they’re supposed to taste! The salt really brings out the taste of the butter. This is not your traditional shortbread recipe but OMG, these are the most delicious, melt-in-your-mouth shortbread! 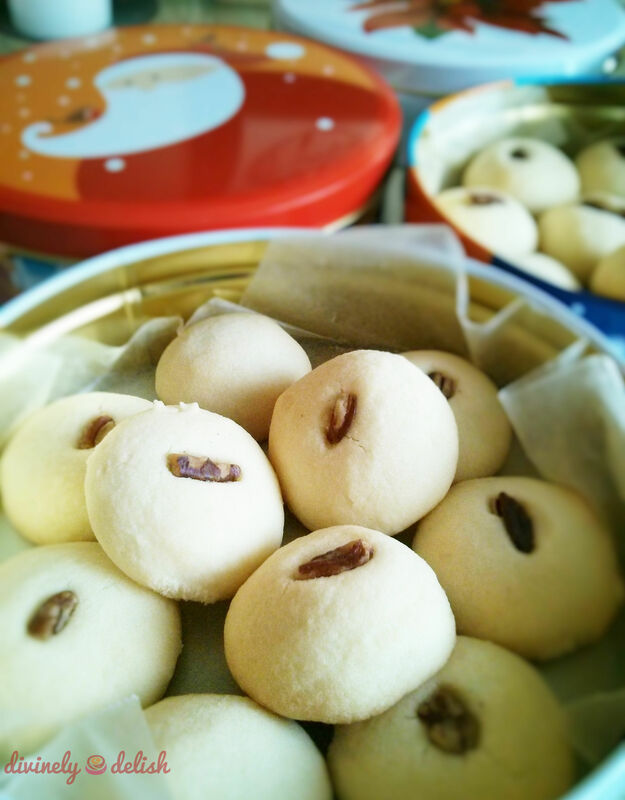 I’ll definitely be adding these shortbread cookies to my X’mas baking repertoire from now on. If you’re making them as gifts, make sure you make extra because you will be “tasting” them as you make them! 3) Add dry ingredients and beat until fluffy. 4) Roll into balls and place on cookie sheet (I like to roll them into balls of 20 grams each to ensure they’re all the same size). Flatten slightly with the palm of your hand. 5) Top with pecan halves (optional). 6) Bake 12 – 18 minutes (For my 20-gram cookies, 15 minutes was perfect; bottoms of cookies should be lightly browned). 7) Let cool on cookie sheet for 5 minutes, then transfer cookies to a wire rack to finish cooling. 8) Store cookies in an airtight container. Note: Cookies can keep about a week at room temperature. Alternatively, wrap them well and freeze for up to 3 months.